Trout is considered one of the best guitarists worldwide. He is often mentioned in the same breath as Eric Clapton or Jimi Hendrix, his music being a successful synthesis between blues and rock. Born in New Jersey in 1951, Trout heard the call of music at a young age. His first instrument was the trumpet. A chance encounter with the great Duke Ellington during his childhood encouraged Trout's interest in professional music-making. "This was the turning point in my life," he recalls. In 1960, Trout switched from the trumpet to the electric guitar. He locked himself in his room for months and practiced until his fingers bled. From the moment he connected his guitar to the amplifier, there was no going back. 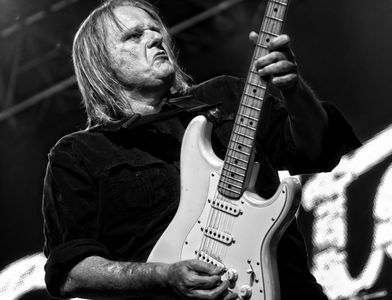 After Trout had already made a name for himself in Europe through extensive tours and various album releases, the breakthrough on the US market finally followed in 1998 with the release of "Walter Trout". In a BBC radio poll, he was ranked 6th among the top 20 guitarists of all time (a few votes more would have put him in the top 5 along with Jimi Hendrix and Jimmy Page). Recently, he has been working on the concept of a very special Blues cover album. Trout explains: "I didn't have something like a compilation of much strained greatest hits in mind. I wanted to re-record some almost forgotten old blues songs that have rarely or never been covered before. So things took their course." What came out shows on Walter Trout's new output "Survivor Blues". The album was released on January 25th 2019 on Mascot Label Group.